✔This plush 3 bedroom apartment sleeps 6, has 3 toilets, one bath & one shower. ✔It has a fully equipped kitchen, washing machine & drier too. ✔It is very family-friendly. With a baby cot, a high-chair, a few toys, a Smart TV with Netflix access. All rooms are on one floor. ✔There is an open plan living room & dining room, decorated beautifully. ✔There are two shared pools outside the apartment. One toddler splash pool & one deeper pool. There are also some sun loungers too. ✔It is very well located. Small shops offering all daily essentials are a 3 mins walk away, along with some cheap good restaurants. There is also an ATM you can withdraw money from & a pharmacy. ✔Marjaane supermarket is about 15 min walk away where you will find everything you could need from nappies, spices, bikinis or burkinis, toys, meat & veg, etc. Remember to take your shopping bags with you. ✔The beach is about 15 mins walk away although you can get a taxi for 10Dh (about £1). 📣TOP TIP on taxis: The small orange taxis can only accommodate 3 people at a time so if there are more of you, you will need to take two. The “grand” taxis are larger but they are more expensive and harder to find. The grand taxis can take up to 6 people depending on their size. The site is fully secure. Aurelie will send you all the information you will need. When you arrive at the site, you will need to sign a form and present your passports for security. It is all pretty straight forward. Aurelie will send you a security code which allows you to enter/exit the secure apartment at any time. 📣TOP TIP : There are some hotels nearby, like the Rofaida Hotel, where you can enjoy a buffet breakfast for 40Dh (about £3.50 a head). We never used the bikes because there were 6 of us and only 3 bikes, but if you do enjoy bike riding then that option is available. 📣TOP TIP : The beach is a good 15 minute walk away. At first it’s a little confusing how to get there. So do remember your landmarks along the way. We used these plant pots to remember which street to walk down. There is also a secure under ground car park, with a fob key should you wish to use it. All of this will be shown to you by the house-keeper. Although Zeina doesn’t speak English, her younger brother Yunus was very helpful in explaining things in English. Since Yunus was on his holidays, we used to take him out with us, when we went exploring. I hope enjoyed our boys’ company, as much as they enjoyed his. The apartment is not cleaned daily but if you do ask the house keeper in advance, she can clean the apartment for you mid week, for a fee. Aurelie’s apartment has become very popular, so if it’s not available for your dates there are others in the same complex Iken Park. They might not be quite as fantastic as this apartment though. 📣TOP TIP : Book a camel ride or a day trip to Paradise valley ! 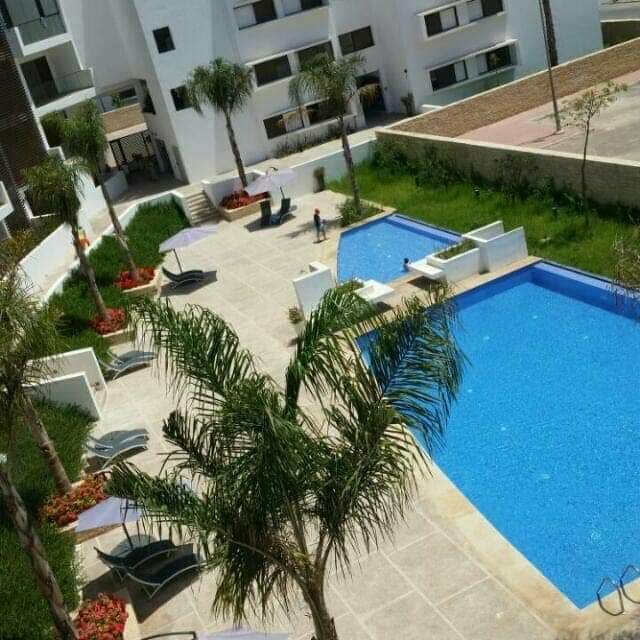 Alternatively, Agadir has many hotel-apartment complexes, like Rofaida & Atlantic Palm. These offer the best of both worlds, the space of an apartment with the advantages of a hotel. Booking.com, Expedia, OnTheBeach & LoveHolidays are great places to find such complexes. Previous How to Get to Essaouira. Next Hotel-Apartments in Marrakesh, the Perfect Fit for Larger Families.